Attending Glastonbury Festival can be hard work. The mud, lack of sleep and the countless miles you have to cover to see all the stages and acts. 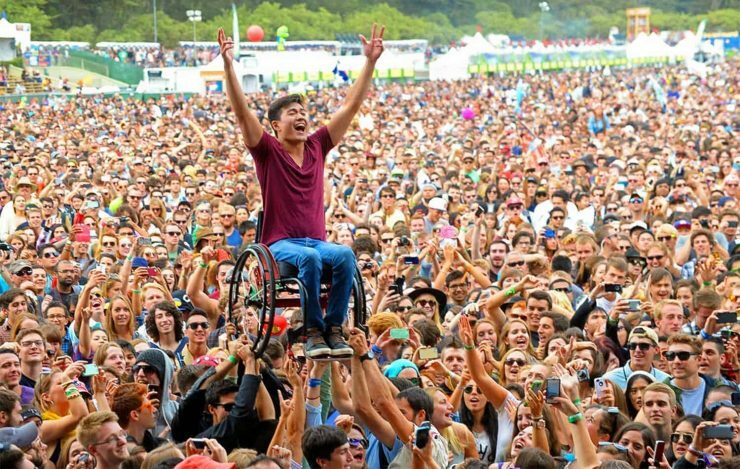 But what about the challenge of attending the festival whilst having a disability? Glasto welcomes everyone to its glorious fields, but how accessible is it for disabled festival goers? We spoke to a few people who have attended Glasto with a disability to find out more. We first got in contact with Hannah McKernan, whose disability requires her to take a lot of medical equipment with her to the festival, including special food which needs to be stored away in a fridge. After her food curdling in the tent at another festival, it was realised that a fridge was essential! She usually stays in the accessible campsite, Spring Ground, which offers space to charge her feeding equipment and showers to keep her Stoma clean, something that could be a struggle to do when planning to camp in one of the other fields. Whilst camping at Spring Ground she found that the fridge wasn’t suitable for her needs, but the accessibility team made arrangements for her to use facilities in the Medical Tent. ACCESSIBLE CAMPSITE: Spring Ground is a dedicated campsite for Deaf and disabled customers. Anyone wanting to stay in this field must pre-register with the Access Team (see Contact information below). Along with countless others, Hannah has access to the viewing platforms available at all major stages. These areas allow those with disabilities to view the acts in comfort. British Sign Language interpreters are also available as a free service throughout the festival, making sure deaf festival goers don’t miss out on any of the action. Hannah quoted the shuttle bus services that covers the car parking, accessible campsite and a few of the stages as a ‘Godsend’. It allows her to move equipment around with ease, and without this service, she would be unable to move it around the site at all. I was contacted by Zoe Mundy, whose husband uses the accessibility features. She said that even during the wettest, muddiest Glastos, the shuttle bus service has allowed her and her husband to enjoy many parts of the festival. • Wheelchair accessible toilets and showers. • A High Dependency Unit containing an electric raised bed with a hoist above, it also has a sink and toilet. Please note that hoist slings will not be available. If you wish to use this unit please bring your own slings. • Accessible sink and fresh water point. • Charging facilities for wheelchairs and medical equipment. • Fridge for the storage of medication. • Hot water for cooking/ drinks. • Stewards on hand 24/7 offering assistance where necessary. Although everyone I spoke to praised Glastonbury for their accessibility efforts, there are a few areas that are still difficult for guests with disabilities to enjoy fully. Despite the shuttle bus service, the Medical Tent isn’t so close to Spring Ground, and due to Glasto’s natural hilly terrain, it is quite difficult to access at times. Hannah even said that in the future she would consider camping elsewhere to be closer to the Medical Tent. Perhaps in the future, the position of the Medical Tent could change, as many campers using Spring Ground require the Medical Tent at least once throughout the festival. Another issue mentioned was the lack of respect towards disabled toilets. Clean and easy to access toilet facilities are essential to those with both physical and hidden disabilities. Zoe’s husband has been hospitalised countless times due to infections, so a clean toilet is super important. She told me that in late-night areas like the Dance Area and the Naughty Corner, the disabled toilets had been broken into, and due to the mess were not suitable for their needs. It’s important to note that an outside festival is never going to be perfect, especially for those with specific accessibility needs. The massive size of Glastonbury offers its own challenges, and some smaller festivals may be more accessible, but the spirit of Glasto is undeniable. I have seen countless people helping others throughout the festival, myself included. I asked Hannah for any top tips for attending the festival with a disability and she mentioned that forward planning and organisation is key. Printing out the confirmation of your access requirements allows you to keep all staff aware of how they can help. PA TICKET SCHEME: If you are unable to attend the festival without the assistance of a PA you can apply for one of our complimentary PA Tickets. Customers wishing to apply for a PA ticket must purchase their own ticket in the October sale but not one for their PA. Attitude is Everything is a charity pushing venues to think beyond their legal obligations for accessibility and through working with the Glastonbury team for over 10 years they have made some changes that are becoming the benchmark for other big events. By taking on board the input of the Attitude is Everything team, the festival has been able to think about some realistic solutions which make Glastonbury Festival accessible not just for attendees but for acts and festival staff as well. It’s the little things that are making a big difference – from pushing for power sockets on viewing platforms, so that chairs and pumps can be recharged, and increasing the number of viewing platforms and areas (not just at the music stages but all around the festival site), to more accessible toilets and wheelchair accessible bars. Micheal & Emily Eavis’ Glastonbury Festival became the first camping festival to receive the Charity’s Gold Standard for best practice, their charter for commitment and proactivity towards making Glastonbury as accessible as possible. The Access Office is currently open on Mondays only, between 10am – 4pm. Click HERE to download a PDF of all the access information.